In my last blog , I described some of the initial results from the change programme started by Peter Sommer when he joined Olfama as CIO and I described the challenge with project portfolio management. Peter and John started to define the project portfolio management process with a brainstorming session. They found that the process should ensure that every corporate strategic initiative was supported by at least one project and at the same time there shouldn’t be too many independent projects supporting a single initiative. They knew that projects could be categorised in three distinct groups: Projects to help keep lights on (Run the business), projects to grow the business and projects to transform the business. Peter and John realized, that projects supporting a strategic initiative would fall into the “Grow” and “Transform” categories, and that the metrics for these projects would be different from the metrics for projects in the “Run” category. Three different ways to prioritize would be needed #1: Prioritize between run, grow and transform, #2: Prioritize internally between strategic projects (grow/transform) and #3: Prioritize internally between operational projects (run). The projects defined to replace the decommissioning candidates found during application landscaping would by default be projects in the run category, but Peter realised, that a business process supported by an outdated system with very few users probably were a candidate for change as well and perhaps a candidate for transformational change – which would put the project replacing that old system in the transform category supporting a strategic initiative to transform that part of business. This would also mean an entirely different funding mechanism. In fact, it would transform IT itself from being mostly involved with operations to become more involved in business and in business transformation more importantly. 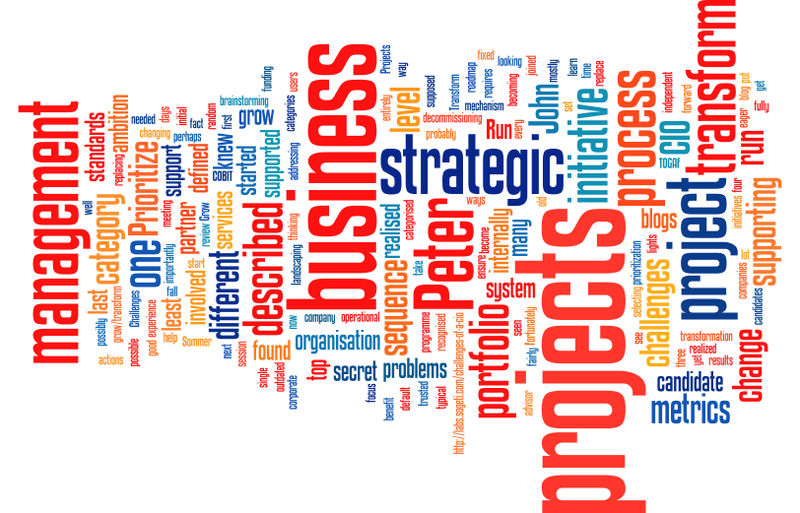 Having defined the project portfolio management process with metrics and prioritization mechanisms with John, Peter was now looking forward to a meeting with top management on the project portfolio management process and he realised that it could be seen as an informal “first 100 days review”. He was eager to learn if top management recognised that he was on his way to fulfil his secret ambition of changing IT from a support services organisation into a strategic partner for business. Why was it a secret ambition? Peter knew that there is a fairly fixed roadmap from being support services organisation over a trusted advisor to becoming a strategic business partner – if you have problems at one level – you are supposed to focus on fixing those problems. When you are fully in control at one level, then you can start thinking of progressing to the next level. In these last four blogs I have described a typical set of challenges for a new CIO and a possible sequence of addressing those challenges. Fortunately, many companies don’t have all those challenges, but I have yet to see a company that wouldn’t benefit from at least one, and possibly more, of the initiatives I have described in these blogs. You can get a lot of inspiration for the “What” and “How” in the COBIT and TOGAF standards, but the sequence of actions to take shouldn’t be random and selecting a good sequence is not a topic of the standards – it requires experience.